Who will win the 2018 Community Shield? It's time again for the Community Shield, and in 2018's game you'll see FA Cup champions Chelsea face Premier League title holders Manchester City. It's taking place at Wembley Stadium in London, that has a capacity of 90,000 fans. Kick off is set for 3PM BST on Sunday, August 5. That's 10am ET or 7am PT or midnight in Australia AEST. 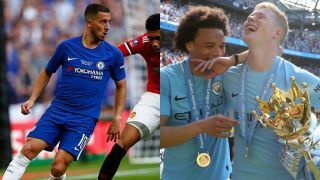 This weekend's biggest football game is the Community Shield match that will be a must-watch for Chelsea and Manchester City fans, as well as those who are still missing the World Cup. We'll tell you how to live stream the whole thing - no matter where on Earth you live. The Community Shield is only played once a year, and both teams will want to add the trophy to their cabinets before the Premier League pressure kicks in next week. Chelsea are here after winning the FA Cup back in May, while Manchester City are this year's Premier League champions so get to face them. Both managers Guardiola and new Chelsea boss Maurizio Sarri may use this to experiment ready for next week, but each also wants to win this to get their season off to the best possible start. Below you can learn about how to watch the game live from around the world. If you live in the UK and have access to BT Sport, you're going to be able to watch the Community Shield live with ease. The game is being shown exclusively on BT Sport 1. BT Sport is available through BT's own service, Sky and Virgin, but it costs extra to add onto your package each month. It'll give you access to a wide variety of sports channels though. It's worth noting that you get free BT Sport at the moment with BT fibre broadband deals. You'll also get the streaming capabilities that will allow you to live stream games to your computer or you can use the apps for iOS and Android as well. And if you're not in the UK, but still want to watch that BT Sport coverage, then you can always jump on a VPN to relocate your computer's IP address to one in the UK. If you live in the US, there's no super easy way to watch the game live. It is being broadcast, but through SiriusXM FC, which is a dedicated soccer radio station so you'll only be able to listen to the action. If you're dedicated to watching the game live, we'd recommend pairing one of our favorite VPN recommendations with one of the other live streams on this page to see the action first. Those who live in Australia won't be able to watch the action easily either, which is a shame but if you want to watch the game live you can always use one of the VPN recommendations on this page. That said, you'll also need to find a way to watch BT Sport with that VPN though and that may be much easier said than done.